The vast majority of commercial nut milks — even the grower-owned, non-GMO versions you can buy refrigerated from the natural foods store — contain gums, emulsifiers and stabilisers. If you drink dairy milk alternatives and your goal is to eat as much real food as possible, follow this recipe to make any type of nut milk at home yourself. 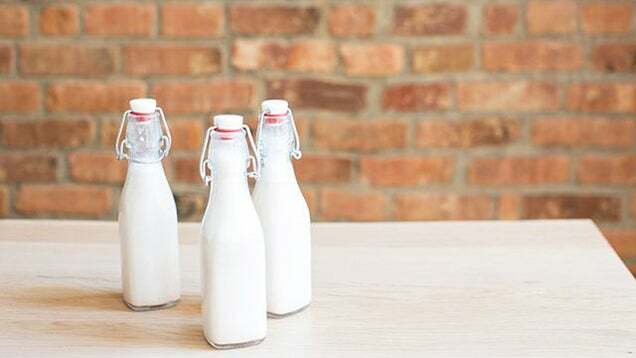 We've shown you how to make soy milk, almond milk and a variety of other non-dairy milks yourself, but if you're more of a recipe person, it's worth checking out this all-purpose formula for making dairy-free milk out of any kind of nut. Equipment-wise, all you need is a blender and a nut milk bag or cheesecloth. While the recipe calls for other flavour-enhancing ingredients like coconut oil, dates and cinnamon, feel free to exclude all of them if you just want a basic version, or if you're trying to watch your sugars or fats. Try this recipe (included in the link below) with walnuts, cashews or almonds, or if you're feeling experimental, hazelnuts, macadamia nuts or sunflower seeds. Why do they call it milk?